Kurt Jensen Lars M. Kristensen 1 Coloured Petri Nets Department of Computer Science Kurt Jensen ADA-220 Coloured Petri Nets Modelling. 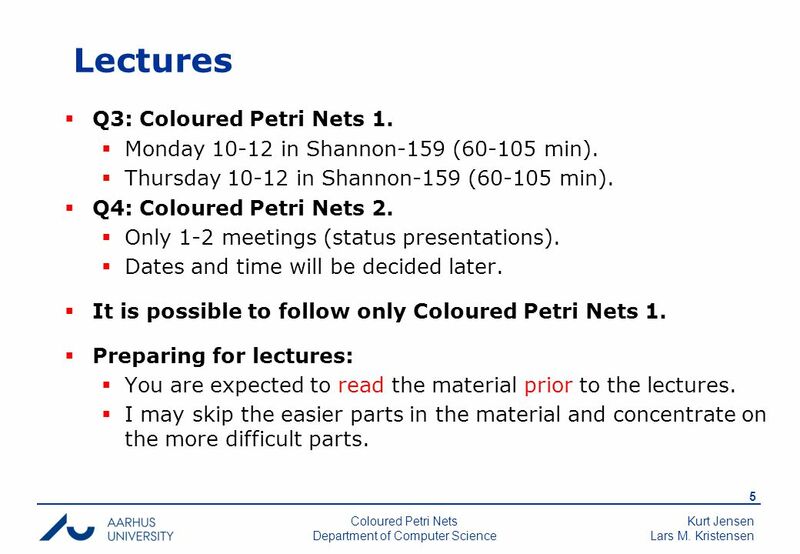 5 Kurt Jensen Lars M. Kristensen 5 Coloured Petri Nets Department of Computer Science Lectures  Q3: Coloured Petri Nets 1.  Monday 10-12 in Shannon-159 (60-105 min).  Thursday 10-12 in Shannon-159 (60-105 min). 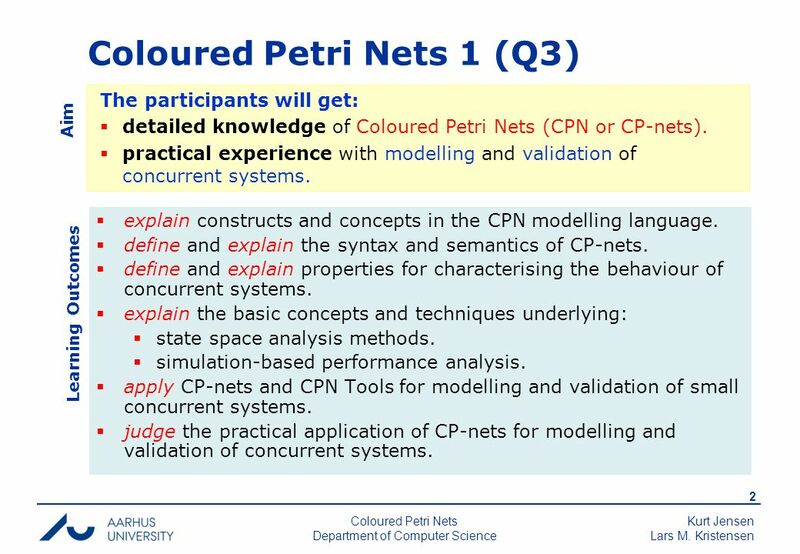  Q4: Coloured Petri Nets 2.  Only 1-2 meetings (status presentations).  Dates and time will be decided later.  It is possible to follow only Coloured Petri Nets 1.  Preparing for lectures:  You are expected to read the material prior to the lectures.  I may skip the easier parts in the material and concentrate on the more difficult parts. 7 Kurt Jensen Lars M. Kristensen 7 Coloured Petri Nets Department of Computer Science Mandatory projects  Q3: Coloured Petri Nets 1. 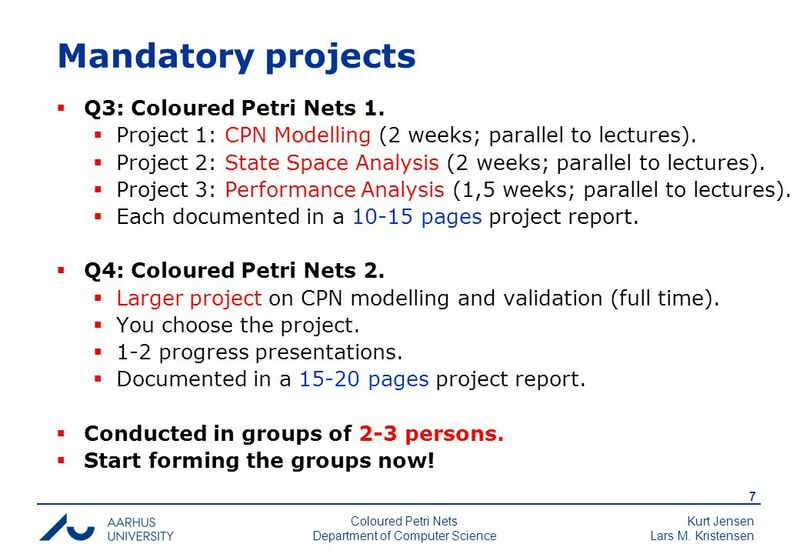  Project 1: CPN Modelling (2 weeks; parallel to lectures).  Project 2: State Space Analysis (2 weeks; parallel to lectures).  Project 3: Performance Analysis (1,5 weeks; parallel to lectures).  Each documented in a 10-15 pages project report. 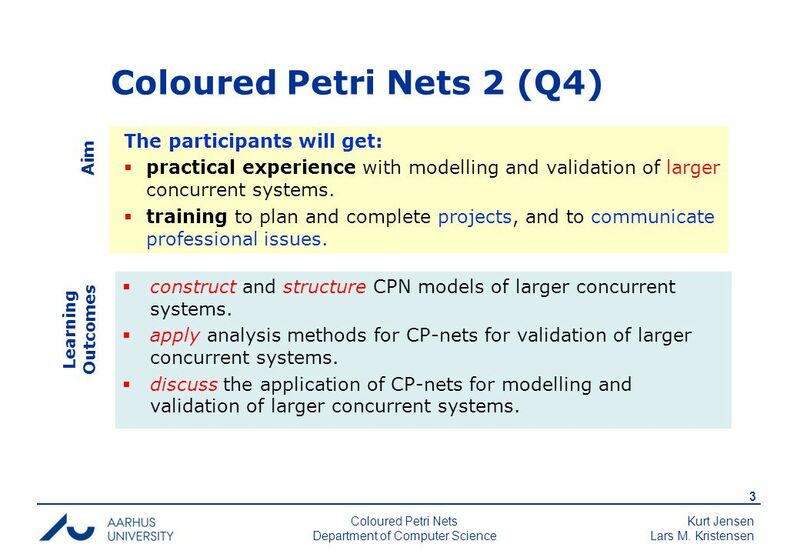  Q4: Coloured Petri Nets 2. 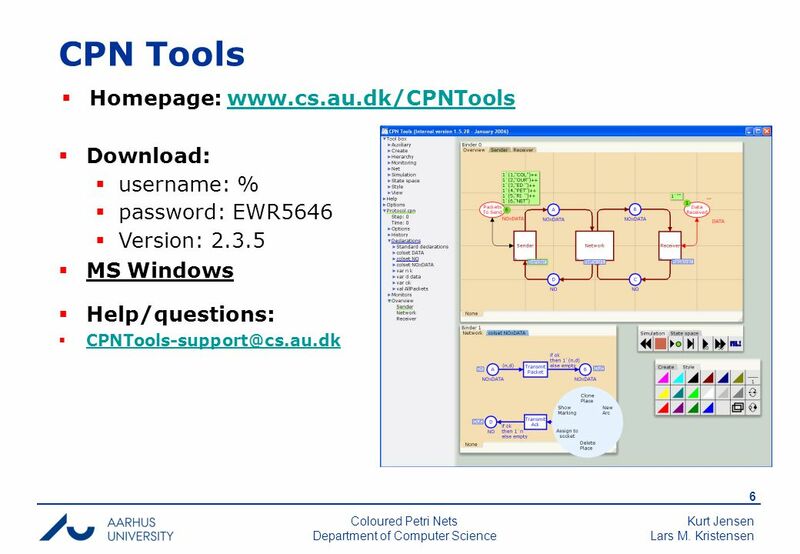  Larger project on CPN modelling and validation (full time).  You choose the project.  1-2 progress presentations.  Documented in a 15-20 pages project report.  Conducted in groups of 2-3 persons.  Start forming the groups now! 8 Kurt Jensen Lars M. Kristensen 8 Coloured Petri Nets Department of Computer Science Exam(s)  Coloured Petri Nets 1:  Individual oral examination. (20 minutes, no advance preparation).  Based on topics from the textbook material and the two projects.  Everyone is required to take the CPN1 exam. 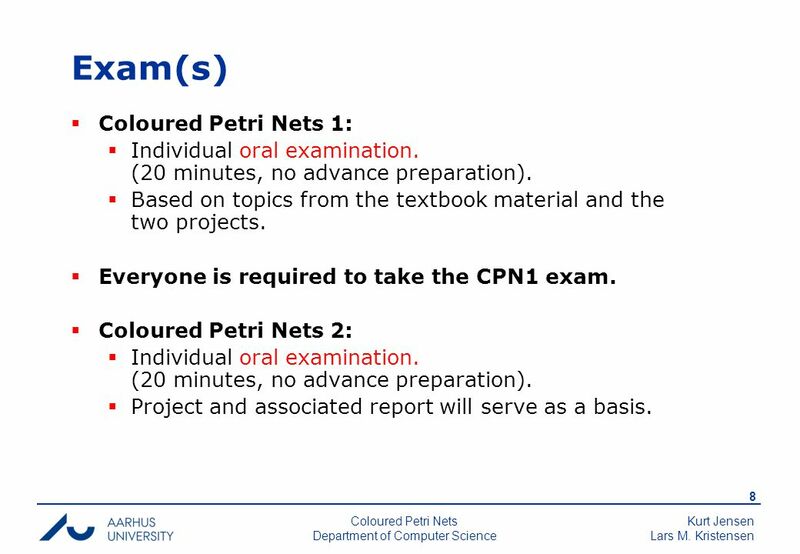  Coloured Petri Nets 2:  Individual oral examination. (20 minutes, no advance preparation).  Project and associated report will serve as a basis. 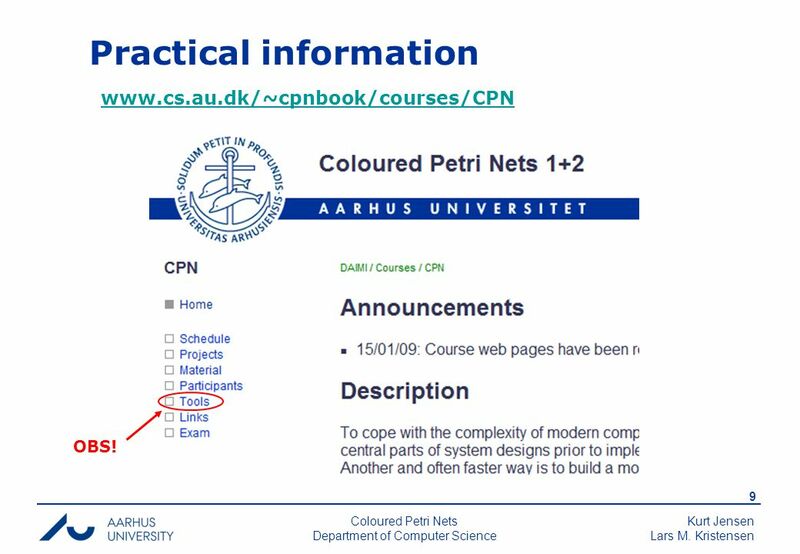 9 Kurt Jensen Lars M. Kristensen 9 Coloured Petri Nets Department of Computer Science Practical information www.cs.au.dk/~cpnbook/courses/CPN OBS! 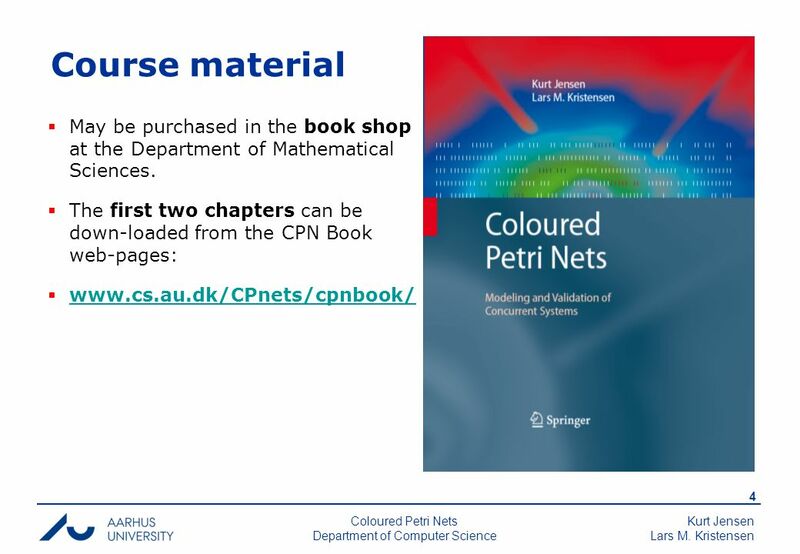 Download ppt "Kurt Jensen Lars M. Kristensen 1 Coloured Petri Nets Department of Computer Science Kurt Jensen ADA-220 Coloured Petri Nets Modelling." Issues in Drug Abuse: Advanced Topics in Addiction (Psychology 486) Course Objectives, Organization, & Requirements Michael A. Bozarth, Ph.D. Department. 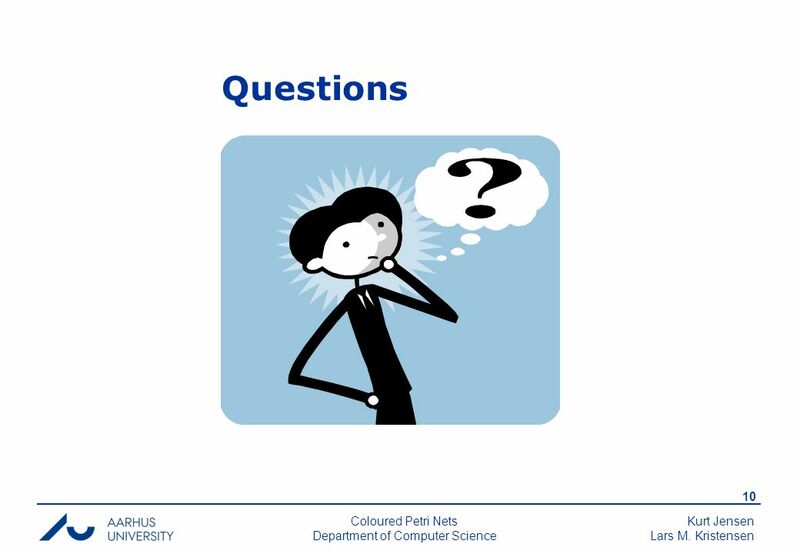 CG152 Introduction: slide 1 CS223 The Project: slide 1 Today's Lecture is in 3 Parts Part – 1: The Project Doron Part – 2: Going through the skipped over. 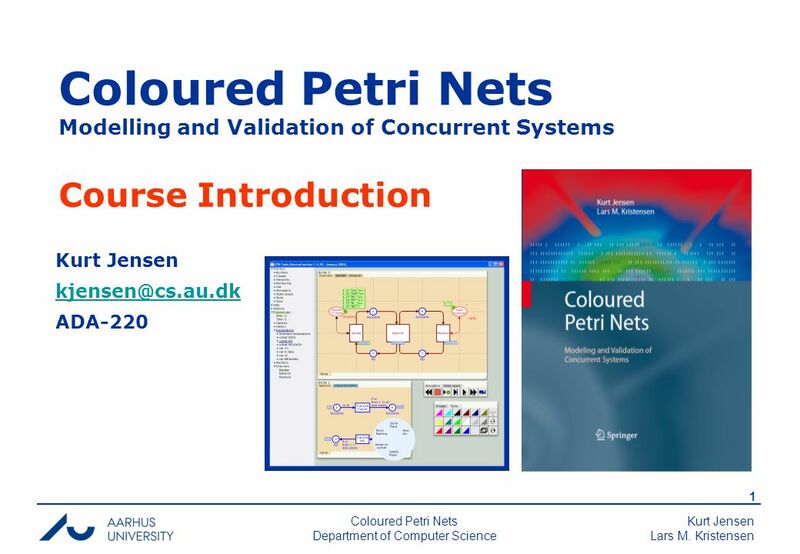 Kurt Jensen Lars M. Kristensen 1 Coloured Petri Nets Department of Computer Science Coloured Petri Nets Modelling and Validation of Concurrent Systems. ½ hour Chapter 2 Java in 30 minutes 1. 2 Rationale ½ hour Teaching a computer language like a logical system is possible. But not necessarily helpful. Introduction to Financial Management. Overview of Financial Management Introduction Keys to Success Stay up in class (complete assignments on time each. Computers and Society Lecture 1: administrative details and an introduction to the class Professor: Evan Korth New York University. Introduction to Financial Management. Overview of Financial Management Introduction Keys to Success Recitations Class Structure - Syllabus Text – Financial. Project Workshops Schedule. 2 Important Points to Note Project Workshops will be Thursday at 1315 in LC 50 These workshops are compulsory for all project. ICS 324 Database Systems Second Semester (072) Information & Computer Science Department. IS 421 Information Systems Management James Nowotarski 16 September 2002. Overview of Financial Management  Introduction  Keys to Success  Recitations  Class Structure - Syllabus  Text – 2nd Preliminary Draft of Fin. Mgmt. BAIM 503 ISSUES IN INTERNATIONAL POLICY Ilan Vertinsky Monday 18:30 – 22:00. Modelling with Coloured Petri Nets Søren Christensen Department of Computer Science University of Aarhus. Lecture 1 Concepts of Programming Languages Arne Kutzner Hanyang University / Seoul Korea. King Saud UniversityCSC112 - First Semester 2009- 2010 1 CSC 112 Java Programming I Introduction.